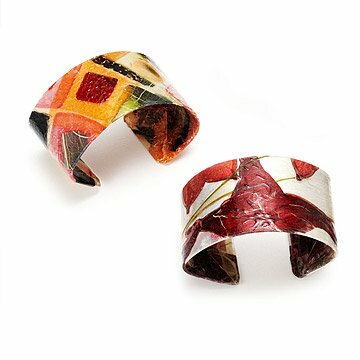 Printed with dried and pressed fruit, these vibrant cuffs bring natural flair to your ensemble. Margaret Dorfman captures natural beauty in these gorgeous, shimmering cuffs. Inspired by blossoms and fruit slices floating in a pond, Dorfman creates these vibrant pieces using fresh fruits like papaya, starfruit, and more that are then cured, pressed, aged, and dried into a thin sheet. The sheet is then fused to a copper cuff that shines through the parchment, producing a lovely glow. An included card details each variety seen on your unique cuff. Handmade in California. If necessary, clean with damp cloth. To wear slip on wrist and adjust to fit with gentle bouncing motions. Do not twist or overextend the cuff. Yes I would buy this again but would only order one. Was a gift. Beautiful but ordered 2 for my sister's birthday thinking they would be 2 different ones based on the photo. Instead 2 alike arrived. Since it is fragile I guess she can keep the second in case the first one breaks. She does like it a lot! Everything about the item is lovely and you can tell that delicate hands and a keen eye for beauty crafted it. The only reason I did not give it 5 stars was because the item is not as colourful and the colours are not as vibrant as they are in the photo but I realize it is the nature of handcrafted items to appear differently with each creation. Don't let that stop you from purchasing this item because it is stil undeniably beautiful and unique and it is sure to please anyone who receives it. 4.5 stars out of 5 is what I would like to give. Looking for a unique gift for girlfriends. These totally fit the bill. Overall, I would still recommend this as a gift. The bends that create the cuff shape are sharp angles that require I bend it more in the middle to give it a more rounded shape that looks better on the wrist. I worry that bending it myself will damage the applique of the fruit. Still, overall, I will give it as a gift and think the recipient will wear it and think it's beautiful. Arrived faster than expected. Packaging and product undamaged. This cuff is absolutely beautiful! I really enjoy the natural beauty of the products used to make it. I think it makes a perfect gift - fun and unusual!